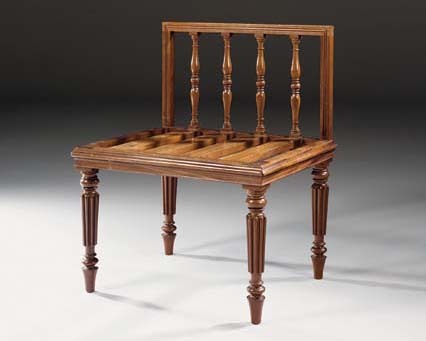 In 1812 Gillows supplied eight similar trunk stands with reeded legs (but without the back gallery) to Wilbraham Egerton for Tatton Park, Cheshire in 1812. They cost £1 16s 0d. each (see N. Goodison and J. Hardy, 'Gillows at Tatton Park', Furniture History, 1970, pp. 11 and 12, fig. 14A). The present lot is particularly unusual in having a back. A related trunk-stand, again without the gallery, was sold anonymously, Sotheby's London, 24 April 1998, lot 44.